Though not a sight one would ever hope to see, a row of bodies covered in sheets is easy enough to understand. The first thing that feels wrong here is the solidity of the sheets; the row of figures are marble statuary rather than fabric covered human remains. This realisation gives the figures a new familiarity, one rooted in religious representation. 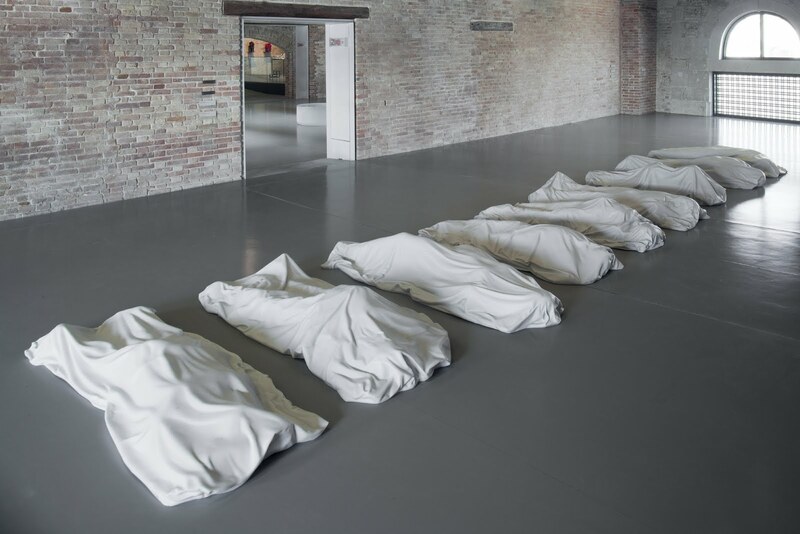 Maurizio Cattelan’s All, on show as part of the exhibition In Praise of Doubt at Punta della Dogana in Venice, is a row of nine marble statues. 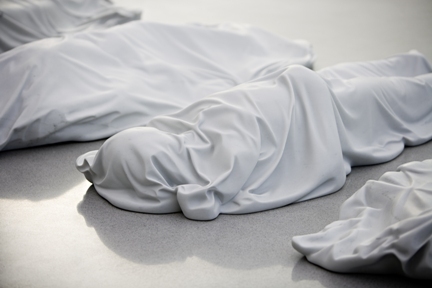 Each is a figure draped in fabric, but these are strange bodies, Nothing is quite where it should be. It takes time for the oddness to permeate and open up a new question of quite what these figures looked like. Why do heads seem to rise from the place where the chest should be? How did that arm get there, especially if that’s where the shoulder is? Maurizio Cattelan has always told jokes through his work in a way. His sculptures can be funny, playful, touching, disturbing, downright weird or pretty much any combination of these things. All is beautiful and fascinating. It’s also disturbing to an extent but wanting to figure out the figures offsets this; in the end perhaps All is a visual problem to be solved. This entry was posted in Sculpture and tagged All, art, In Praise of Doubt, marble, Maurizio Cattelan, Punta della Dogana, sculpture, statuary, Venice by Ann Jones. Bookmark the permalink. I feel like figuring out why certain body parts are where they are under the sheet makes the piece more disturbing, not less – a real sense of gothic horror! Great post.